Household chores will likely be cast off in favor of egg hunts and family get-togethers this weekend, and that’s a good thing. Happy Easter! The arrival of spring, however, is known as much for bunnies and daffodils as it is for thorough cleanings. So the timing seemed right to consider an ingredient that can disinfect your counters as effectively as it can dress your salad: vinegar. Basic household items like baking soda, toothpaste, lemons, and vinegar have long been used for purposes beyond the obvious. They offer convenient ways to scour, deodorize, remove stains, and more. What’s more, they do this without the use of harsh chemicals and for a fraction of the cost of many store-bought cleaners. For some people, however, the pungent smell of vinegar is off-putting. All-natural and boutique products often rely on essential oils to make things smell good, and it occurred to me years ago that the natural oils in citrus peels might accomplish the same goal. My initial experiment involved stuffing orange peels into a Mason jar, pouring basic white vinegar overtop, and storing the jar in a cupboard without opening. After two weeks of steeping, the essence of the orange peels did, in fact, permeate the vinegar and I deemed the test a success. When I shared this “recipe” in this very space three years ago, I was astounded by the response to my little experiment. Orange Vinegar has been “pinned” hundreds of thousands of times and shared countless times on Facebook and beyond. If you look below, you will see over 400 comments! Readers have mentioned making versions with clementine, lemon, and lime peels and have noted the many ways they use vinegar in their household cleaning. And who knew? Lots of people use it as a hair conditioner, too! There are various questions and a few funny stories thrown into the mix. The resounding feedback is that people like to cook and clean with vinegar and they enjoy the ease with which this green cleaner benefits from a little orange. After writing The Fountain Avenue Kitchen blog for several years, I have learned that many readers appreciate those comments as much as I do. So, if you try this—or any other recipe—I welcome you to leave a quick comment. In this case, feel free to include the ways you put basic household products to work beyond their intended use. Curl the peels around the inside of the jar. For my last batch, I used two large oranges and would not have been able to fit another peel. If your oranges are small and you can fit another peel, feel free to add it. Pour the vinegar into the jar to cover the peels and close tightly. Store the jar in a cupboard or another cool, dark place for two weeks. Then remove the orange peels and transfer the vinegar to a spray bottle. For basic cleaning purposes, I dilute the vinegar with water by 50%. * You may vary the jar size. Just choose one with a tight-fitting lid, and then fill it with peels and cover with vinegar. Also, feel free to experiment with peels from other citrus fruits. I have used vinegar to clean our granite countertops for years with no ill effect, but some people recommend against doing so. If you are unsure as to whether vinegar should be used on a particular surface, test it in an inconspicuous spot. For anecdotal information, you may also wish to skim through the many comments below. Thank you! So nice when easy, inexpensive and natural really work! This has been a regular product at our hour. I buy a gallon or 2 of vinegar and use almost anything for fragrance. I have roses so I add rose petals, add sister is, add garden is, add almost anything. Cucumbers make for a fresh smell. I even make perfume. I use exerciser for most of my perfumes, and some things I run thru the blender to give my perfume/cleaner a stronger smell. Also, with some of the fruits and vinegar I pop the mixture in the microwave for a minute or 2 before I seal it. You can use some of the scents almost immediately but I usually try and let them set a week or 2 before I use them. I don’t buy window cleaners, furniture dusting cleaners, floor cleaners, some of the scents I use as laundry scent improvers, works great for spring house cleaning, . I use it in my shampooed when I do the carpets..I use a lot of lavender in the kids rooms and laundry. It’s amazing the money you can save with vinegar, plant blossoms from you yard, rinds from kids breakfast fruits, and sometimes some exerciser. Thank-you, Amber. I was wondering same. I didn’t understand most of that post. Ann, I would say it is perfume that you using for when you go to the gym and exercise. Hi. When using cucumber do you use the peels or the veggie part too? I’m a big fan of cuke essence. Thanks. I’ve never tried with cucumbers but I’d use the peels only. Feel free to report back! if you use the entire vegetable then you’d end up with pickles so i’m assuming it’s just the peels. I am doing this with oranges as well as grapefruits however no matter how long I steep the vinegar smell is still very strong any suggestions? Maybe it’s the ratio? In my “experiment,” after two weeks with the amount specified, the orange scent was definitely more pronounced than the vinegar smell. Here’s another idea: When I clean with vinegar, I often dilute it by half with water. You could try the orange peel trick starting with 50% water, 50% vinegar. Keep me posted! Oh, thank you for the cleaning tips! I had the same problem like the lady above. I’ll try using orange+lemon and we’ll see what it turns out. My pleasure and hope they help, Brianne! I had the same problem, but there is a better solution: you need more citrus. There are a lot of factors that play into how much citrus oil is in the rind, and most of them you can’t control. Just like with herbs and spices in cooking, if the flavor isn’t strong enough, you need to add more to compensate. If your peels don’t have enough oomph to infuse your vinegar in one go, you need to repeat the process with fresh peels. After 2-3 weeks, the peels should have subtly changed color, and their bright color should have diffused into the vinegar. Remove these spent peels and pack fresh peels into the jar. Wait another 2-3 weeks. Check the scent. The citrus aroma should have doubled. If that is enough to overpower the vinegar odor, you can strain, dilute and use it, but if not, repeat the process a third time with fresh peels. Make sure you use a mesh sieve, not a paper filter, when you strain out your peels. Just like with coffee beans, a paper filter will strain out the aromatic oil, removing some of scent from the vinegar. I would strongly caution against adding water to the vinegar before the steeping process is done. You lower the acidity of the solution by doing so, and that could promote bacteria or mold growth, or other nasty stuff. The first time I tried this, I found three tiny worms floating in my vinegar after week 1, and it was the acidity of the vinegar that killed them. If I had diluted, those worms would have been alive and still eating the citrus peels. Ick. Water also is a major agent in decomposition, whereas vinegar is a preserver. You don’t want your citrus peels rotting in your jar. That would smell REALLY bad. Only dilute after you’ve strained out the organic matter (the peels), and only dilute the amount you expect to use in about 1 week’s worth of cleaning. Keeping it concentrated until you are ready to use it will help the scent last longer. Thanks so much for chiming in with all your helpful tips, Jane. Much appreciated! typically once the vinegar cleanser dries you should no longer smell it. Even if I use pure vinegar for anything the smell goes away. maybe you just have to get use to the smell a little bit. Vinegar is also great for smelly dogs after a bath you can spritz em rub it in and dry them it’ll help remove any odor. works great for those stinky dogs who reek of ciggerettes that come into work and nothing else will remove the odor. It than leaves the dogs super soft and shiny. I don’t think your doing anythign wrong, vinegar just has a very strong odor. Thanks for the comments, Amber. I think you are right about the smell disappearing. This simply helps people who don’t enjoy the smell while cleaning. I hadn’t thought of using this on dogs! Tell those dogs that smoking is bad for them. I air dry my orange peels on a plate for about a week then course grind in a blender. I then place the peels in a jar and cover with vinegar. Let it sit for a week and strain out the peels. You will have a very concentrated orange solution. Great idea, Vickie! Thank you for sharing it here! Correct me if I am wrong here, but drying them out would defeat the purpose, no? Give that one of the things desired here is the oils from the peels, drying the peels wastes the oils. This is no the case imo,,,,The oil wont evaporate, just the water ….In fact the oils in the peel will be more concentrated after the water is gone….Hope this helps….And for those of you making dish soap at home….For gods sake leave the vinegar out of your soap mixtures…Its simple science you learned in 8th grade…Acid in base NO NO…..They cancel each other out….No seriously, its science…and proven…Have good day everyone.. Thanks for your comments. Realistically, there is very little oil per squirt, so that is probably why there is no perceptible residue, even once evaporation occurs. I understand what you are saying about vinegar and making dish soap at home but what I would like to know is would it be okay to put vinegar and a store bought dish soap like Dawn together? Would one still cancel out the other? I was at a store yesterday and a man that works in the store told me that his wife uses that to clean her bathroom and it just melts the hard water spots away. I will try this myself instead of the harsh antibacterial cleaners I have been using. Thanks in advance for your comment. You might just be onto something, Barbara. I haven’t mixed vinegar with dish soap, but it’s certainly worth a try. I’d love to know what you think. Just reading through a little late then never hehe! Yes drying the peels only release the water to evaporation. Dried orange peel is a great fire starter because of the concentrated oils! Dry some and keep in your camping gear. Actually, the cleaning agent in orange peels is d-limonene. It is found in many commercial cleaning solutions. This oil is in the skin of the orange. You can feel it spray when you peel an orange. Many people, myself included, are sensitive to this oil. Use caution with d-limonene Products if you are sensitive. If you dry the skins, and I recommend you do this to prevent mold, you do not lose the oil since it does not evaporate. Thank you for the insight, Berta. I’m sure that many people will find it helpful. What is the ratio of orange peels to vinegar? 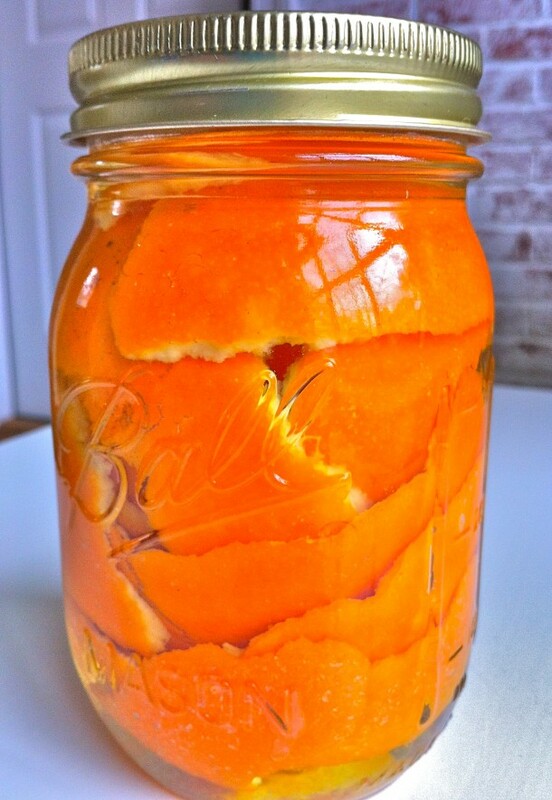 You want two orange peels per 16-ounce (2 cup) jar and then vinegar to cover. Hope you enjoy! Try adding about a half a cup or more of rubbing alcohol to it. If you still smell vinegar and find it offensive, you can add a few drops of lemongrass essential oil (or any other that you find appealing mixed with the orange). I have stopped smelling vinegar because I use it so much but I enjoy my essential oils with it in my all purpose cleaner. I’m just wondering if we were to simmer it on the stove for a while if that would take the place of letting it sit for two weeks. I may try that. I’m assuming you use white vinegar? I may try it with cider vinegar too since that doesn’t smell quite as strong. I also clean with an alcohol and water mixture, so I may try adding the orange peels to that too. Orange oil, found in the peels, is a good cleaning agent as well. Thanks for the ideas! I bet the simmering idea would work. I did use white vinegar for my first try. Steeping it in the alcohol/water mixture is a great thought, too. Let me know how you make out and thanks for the comments! The chemical composition of the d-limonene breaks down when you introduce heat. This is one of those times where patience is a virtue! …there’s just no rushing the good life. I would be careful about cleaning with cider vinegar, because that attracts fruit flies, whereas regular vinegar does not. I used white vinegar although I had not thought of that. Good suggestion! I use wintergreen alcohol I get from the dollar store smells better the plain alcohol. I have never seen wintergreen alcohol but I bet I would like it, Susan! I use wintergreen alcohol to wipe down the bathroom, shiniest surfaces first, germiest last. It cuts soap scum, kills germs and smells fresh. It is the green tinted liquid next to the alcohol and peroxide at the drugstore. I actually just tried the simmering method and what I did was put the orange peels and vinegar in glass bowl, covered it, placed it into a larger pot with water around it so it’s not actually boiling. After 2 hours on a gentle simmer, I strained the vinegar and pressed the already soft peels through a potato ricer to extract the most oil from the peels. The result is even better than waiting for 2 weeks! The mixture doesn’t smell like vinegar at all and the orange is very concentrated! Love that idea! Thanks for taking a moment to share your method! What a good idea! I also use vinegar as an anti-itch agent for mosquito bites and bee stings, but the smell is a real turn-off. This would be perfect, since insects don’t like citrus, it would act as a repellant as well! The repellant idea is brilliant! Will be grateful for that idea this summer. Thanks for the comment! Since I use hot water for canning, I would think just pouring boiling water over the peels would be enough. I do not think it would be necessary to boil everything. I also add cloves to the orange peel. That takes it to the next level. I’ve made some just using rosemary as well. It works but the rosemary can get a little “pitchy” smelling so it does not need to soak that long. The cloves idea is brilliant! Thanks for passing along! I am going to try the addition of a cinnamon stick! That is a brilliant idea, Jill! I am currently tincturing orange peels in 80 proof (cheap) vodka. My plan is to then simmer carefully the vodka to evaporate it off–should leave a bit of orange oil behind. As for adding cloves to the vinegar, that has an additional benefit of making it antimicrobial (which is why cloves were used in the first place; to preserve meat). Look up “thieves’ oil” and “thieves’ vinegar” and the tie to the Black Plague in Europe. I put a few drops of thieves’ oil in the washer with clothes that are a little too “ripe” or mildewy towels–works better than anything commercial that I’ve tried! Thanks for the good suggestion, Whitney! If you’d like to incorporate cloves, I’d recommend whole cloves. This would eliminate any powdered residue when cleaning with the vinegar later. I think the combination would be lovely though! what a good idea –I have two oranges that need to be used –will do it today!! Is it not wonderful that other brains are always helping us out in this amazing technical world. If only the bad never showed up!! I use white vinegar in my wash along with the laundry soap, living on a farm, it really helps get the odors out. I’m wondering if you can use a little of this orange vinegar instead? I would think it would be fine…and might smell pretty good. Please let me know if you try. Maybe I will give it a go, too! For a fast fix try a couple of drops of scented oil in the mix, that will help with the odor. Not too much because you dont want an oily cleaner! This seems great, but is far too complicated for my lifestyle. I dissolve a teaspoon of a decent brand of dishwashing liquid in an old spray bottle and I’m done. Perfect spray and wipe cleaner. That sounds like a very good mantra, Char! Thanks for stopping by! It is too complicated to throw some orange peels in a jar of vinegar? The blogger stated she didn’t like unnatural cleaners so you post a recipe for an unnatural cleaner anyways. Seems like a rude advertisement for your own blog in the first place. Love the post Ann. Will definitely be trying this out. She’s talking about the person who suggested the dish washing detergent. That is not natural and not chemical free. Thank you, Jasmine! I must have gotten lost in the sea of comments; ) I love all the feedback and learning from everyone’s input! Looking forward to trying this, I love the smell of citrus. I am going ti try this with BOTH Oranges AND Lemons, separate, of course. Hey, they MIGHT be GOOD together?!?!?! I agree! I was also thinking grapefruit would be good. Let me know what you think! Grapefruit and lemon grass smell wonderful together! HMMMM! Grapefruit essential oil is used to restore vital energy. Maybe adding some to the vinegar will turn a clean room into an energizing one! Sounds like a fabulous combination. Thanks for the great suggestion! Loved the idea so combined suggestions. I made sure I had peel and not the white pith, Heated the vinegar in the microwave and poured the hot vinegar over the peels. It’s only been a few hours but the vinegar smell is mostly gone already, the citrus is heavenly and just need to put it to work though might run through a coffee filter first. Would be a great hair rinse too! Will add more citrus peels to my “starter” as I go along. Thanks! Maybe I should try! Shiny hair is a good thing! Thank you for the comment, Elsa! Using lemon or lime vinegar as a hair rinse will lighten your hair with the sunlight, using it regularly. I always used it to get natural highlights in my hair specially in the summer. I’ve heard of using lemon juice for this, but never vinegar. Thanks for the comment, Laura! One of these days I will have to try vinegar as a hair rinse! I have heard of this but have never tried. Thanks for the great reminder! vinegar diluted in water as a hair rinse really works. i’ve used it for years! made my hair really shiny and easy to style. lemon squeezed into a liter of water also works just as well. One of these days I am going to do it! Thanks for the great reminder! I have been shampoo and conditioner free for almost a year now and will never turn back! For “conditioner” I use 1 TBL. spoon apple cider vinegar and mix that with 1 cup water. I pour it on and let it sit for a few mins. and then rinse it off. It does leave a vinegar smell but that goes away after a few mins., then your hair just smells like hair! I love it and would encourage others to try it, it works great for me. (My friend has really, really oily hair and said that it didn’t work well for her but that she is going to keep trying. I have heard for extreme cases you have to “wean” off your current shampoo. I always thought that vinegar might dry out my hair, but after several suggestions, I am beginning to think I really must try! Thanks for the great tips! To make Vinegar Hair Rinse (as a conditioner replacement)… use 2 tablespoons of Bragg’s Organic Apple Cider Vinegar and 1 cup of water. It’s cheap, organic, and easy…I made the change in January and love it! Somehow, it always seems like vinegar would dry out your hair, but based on what I am hearing, it seems to be wonderful. I will be on the lookout for Bragg’s…thank you, Candice! How is the vinegar for color treated hair? My grandmother always used cider vinegar on my hair as a rinse, but that was in the days prior to coloring it! Thanks for the comment, Lee, and I hope someone can help with your question! I use apple cider vinegar as a hair rinse…..dilute it and keep it in a spray bottle in your shower……spray it on, let sit a bit and rinse out…..the smell does not stay on and it works wonders, I think! I have colored hair and it doesn’t fade it any more than anything else. Love that this works so well! Why not grate the citrus peel into the vinegar? Wouldn’t that help release the oils faster? As far as alchohol in cleaning cheap vodka can be used and does very well. Haven’t tried grating…good idea, especially if you want to use the vinegar right away. Thank you also for the information regarding Isopropyl Alcohol. I actually stick with vinegar for cleaning, but I am sure there are many who use this. So glad you tried this and liked! I appreciate the feedback…thank you! Has anyone commented on how long the oranges are good for? Once you make the cleaning agent – then do you dispose of the peels and start again or can you just keep adding? Very good question! I keep the orange peels in the vinegar for about two weeks and then transfer, without peels, to a spray bottle. I have started subsequent rounds of vinegar with fresh peels but I bet it would work fine if you add as you go. Another solution would be if you have a garbage disposal to use the left over peels to clean and de-odorize the disposal. I usually throw my peels down it and pour the vinegar on top. Now I have a new cleaning agent to try! Another great idea, Jessica! Thank you for sharing it! I would use the orange peels once, then put them in the compost. That is because steeping them in vinegar would draw out the orange oil into the vinegar. This would add to the cleaning ability of the vinegar, but the orange peel would be “used up”. You may be able to use peels twice, depending on how much oil comes out into the vinegar the first time. That is a very good point about the orange oil, Lynda. Thank you for the follow-up to Melanie’s question! Found this through pinterest! I have a question though – does this mixture turn rancid after a certain amount of time? I mean, we go through cleaner quick, but I just want to make a smaller batch if it turns bad quickly. What cleaner did you replace this with? I use a food safe antibacterial cleaner on my kitchen surfaces, is this a good replacement for that? Thanks for sharing the good idea!! I haven’t had the orange vinegar go bad, but we go through it fairly quickly, too. For years, I have used plain vinegar for much of my surface cleaning. I started using it in my kitchen because I didn’t like all the harsh chemicals where we eat and spend so much time. It’s sort of like my all-purpose spray. I hope this helps…and I hope you like it! I am laughing about the spider, Christina, and so glad this was so helpful! Hope the repairs are well underway and that the rest of your pregnancy goes smoothly. That is so exciting!! About the bleach, it DOES KILL the mold. It’s a lot cheaper than the products on the market that say it will kill it. I used to be an Environmental Consultant and am passing along what I learned and personally had to put to use in the home I bought. I mixed 1/2 bleach to 1/2 water (they say you can dilute more with water if you want, but my experience was used in this manner. When you find mold, the way you release the spores (same with asbestos and lead based paint) is to wipe or sweep it. The way you clean it, is to spray with the bleach mixture and leave it be till it does turn white. Once it has turned white, you HAVE killed the mold and can then wipe it away with a wet cloth and just throw away the cloth. I usually spray the bleach mixture one more time just to make sure. When cleaning an area that you suspect is asbestos, the key is water and dawn dish soap. Put a couple teaspoons into a spray bottle, then fill with water. You have to not only spray the item, but the area walking to it and the upwards into the air. The dish soap pulls it down to the floor and the area can be wiped with disposable cloth and thrown away. I would like to add that dealing with black mold, asbestos and lead based paint is VERY dangerous and you should actually research to see the danger you are actually dealing with. Hope this info will help someone. Thank you for weighing in, Becky. I have read a good bit about asbestos and mold over the years and do know that it is a good idea to consult an expert when needing to remove. I wouldn’t want people to try something they weren’t completely capable of doing safely as the health risks are significant. I appreciate you sharing your experiences along with the reminder that this can be very dangerous. Thank you for your insightful comments, Barb, and I, too, love the clove idea! Regarding removing mould using bleach apparently the only thing that actually kills mould spores is rosemary oil whereas bleach only bleaches mould but doesn’t kill it. Dilute some rosemary oil with the citrus vinegar?? I hadn’t heard that before, Kate. As far as I know, the rosemary oil wouldn’t hurt and might add something extra nice to the smell, too! Thank you for the comment! I’ve been reading up on mold lately and vinegar works well, but also recommended were a teaspoon of tea tree oil per 1 cup of water in a spray bottle. It kills the mold on the surface as well as the underlying layers (like in wood). Also recommended was 10 drops of grapefruit seed extract per cup of water shook up in a spray bottle. No need to rinse either solution off… leave on to help it keep working. Thanks for the excellent tips, Donna. I am sure they will be helpful to many! My doctor told me that you can use 1/4 teaspoon in water in a spray bottle, spray your tub, let it sit for 10 minutes then rinse it off. It will disinfect and kill mold or fungus that can cause athletes feet. . Thanks for sharing your tip, Karen! Peppermint oil sprayed around your home will keep spiders and other pests away. I did not know that, Rose. Thank you for the tip! The thread is still live, Debbie, and thanks so much for adding all your helpful comments as well as your personal story. I hope you are able to see health improvements through your ongoing efforts…I am optimistic you will! There’s some great ant, spider, flea, and roach repellents/killers on pinterest. Too many to name but a lot of natural stuff. Can’t wait to try the orange vinegar. Gonna try lemon vinegar too. Heard you put mint leaves in the lemon vinegar and it repels bugs. Love the lemon and mint idea…thank you for the suggestion! It would not turn rancid. The vinegar will pickle the peels. even if u store it in hot weather? the heat wont affect it? I have not had the opportunity to test in extreme heat, but in general, vinegar holds up pretty well. Likewise, this only contains the essence of the orange peel, so the actual fruit of the orange is not there to spoil. I have never vacuum-sealed the jars for this, Dawn, but your gadget sounds rather handy! I’m making some of this now. But I found out you can’t use vinegar OR citrus on granite b/c it can etch it. So i stick to soapy water with ph balanced soap(method is great). Hi Crystal, I won’t recommend it but I’ve been using vinegar on my granite and it is fine. Doesn’t hurt to be safe and stick with the soapy water though: ) Hope you enjoy! Am trying this recipe…great Xmas gifts for my friends! A few of the peels are discolouring and wondered if maybe the jars are not airtight? Anyone else have this problem?
. Also a friend just broke a bottle of pickles on her tile floor and the vinegar immediately took off the shine. That is interesting, Deb. I have not had the peels discolor, nor have I heard of vinegar removing the shine from a floor. But without knowing what kind of floor–or what else was in the pickles!–I really can’t offer much help. I do tend to use vinegar for sinks, counters, etc., although I have heard people who like to use it on their floors. If anyone has any suggestions, please feel free to comment. Thank you for your feedback! Hope you enjoy…and I think I must look for wintergreen rubbing alcohol! Thank you for the tip! For many generations vinegar and soda were the best cleaners. After cleaning they used body, room and linen spray. For many generations vinegar and soda were the best cleaners. After cleaning they used body, room and linen spray to improve the fragrance. Back in the day when there wasn’t all the fancy cleaning products of today vinegar and baking soda was what you used. Glad to see it’s coming back. I had never thought of doing the orange or lemon soaking, so I’m anxious to see how it works. I agree, Jan! Vinegar and baking soda are oldies but goodies! The citrus peels just dress them up a bit. I think if you grate the peel you lose the benefit of the oil. It would be best to put the peel in as done above. Wonderful idea. Here in Aust we can buy Orange cleaners, but I bet they have some chemical carrier in them, will look next time I go to the supermarket. Great idea to use of the skins of Oranges and Lemons. Lemons are great in water as a refreshing drink or with tea. I can’t wait to make a batch of this. We had our hardwood floors refinished about 10 years ago and the installer insisted that the only thing we should use to clean them is a vinegar and water solution. Well, when you’re using it on the floors in the whole house, the vinegar smell can get quite unpleasant. This sounds like a great solution to do away with the smell and maybe even improve the cleaning power of the solution. Thank you so much for sharing. I’m re-pinning to my Pinboard too.! Great comments and I hope this proves to be helpful on your floors. I am betting you will love the smell: ) Thank YOU! Pingback: Start of a long stretch…and Friday Favorites #12 « Okay, Kaye? Great idea! Years ago I had an orange scented window cleaner but when it was gone I couldn’t find it anywhere; would this solution of yours work on windows as well as other surfaces without streaking? Wouldn’t you know, I have used this on most everything except windows, Sue! I would imagine it would work well and you could use the newspaper trick with it…have you tried that? That worked a lot better when the newspapers used a petroleum based ink before they changed to the soy based ink they use now. Vinegar works great on windows! I use it on the outside to remove the hard water deposits from rain. Vinegar and water was “the” way to clean windows (with newspapers as the cleaning “rags”). It’s really wonderful. I love it, Trish…those newspaper rags really do work well! Awesom information and what a great way to have a natural scent for my home. Thank you for the comment, Dori! So glad you found it helpful and hope you enjoy! Found this on Pinterest a while ago and am excited to try! I have a bunch of limes and a huge grapefruit I need to use before they go bad… Will make a jar full of each tomorrow! I have granite and use everything on it without a problem so I am sure this will be fine! I bet the limes and grapefruit will work beautifully. I was just using mine yesterday: ) Report back if you have a favorite! Has any one used limes? I have those on hand currently and not going to the store for another week. Looking forward to stop using Ammonia. It so hurts the lungs when I clean. I have not used limes, Kellie, but I bet they would work beautifully! I use the orange peels and vinegar solution and I love it! I use it in the kitchen, bathrooms etc.After sitting for two weeks I remove the peels and mix the vinegar solution with 1/2 water and put into spray bottles. I like that there is no harmful chemicals!! And it smells GREAT! Thanks for great tip about diluting the vinegar, Leslie. I always did that with the plain vinegar but, for some reason, leave the orange vinegar full strength. Might try diluting next time! Hi i am going to try this now. Since it is hot outside if i put the jar in the sun will it take less than two weeks? And does this REALLY work on hard wood floors with out streaking them because I have tried a lot of different things and there is either a layer of grime residue or it strips the floors. So if this solution will work that would be awesome for my daughter, the baby i watch and my doggies. Please let me know. Have an awesome day. I think I would keep the jar out of extreme heat. You will start getting a nice scent before two weeks, so you could cheat a little. Maybe make two batches and let one go the whole two weeks and start using the other: ) I do not use this on hardwood floors but I have heard from others who have and report good results. Please let me know if you agree or find otherwise. Thanks so much for the comment! Love this idea and will go to the store in the morning to get some fresh oranges!! Thanks!! I clean with vinegar and water daily so this is wonderful! I think you will like it, Michelle! I always liked the 50-50 mix of water and vinegar, too. This just makes it a little more interesting! For a second I was thinking I should use it on my kids: ) Too funny! I must say a HUGE thanks for the idea! I just made 10litres, for my whole family!! How thoughtful of you to make for your family. I am sure they were a hit! Your idea to make popsicles is genius…thank you for sharing the idea!! Hi! I have a question…I am new to “homemade” cleansers and I was wondering…. I have several cleaner “recipes” that calls for vinegar along with the other ingredients, can this “scented” vinegar be substituted in those???? Great for the hair. Vinegar puts the PH back into the hair that the shampoo takes out. I will try the orange because I dont like smelling like a salad after I rinse with cider vinegar. Thank you for the comment, Dawn, and the laugh! I really need to try this! Thank you for the comment, April, and hope you like the addition of orange! I’am allergic to bleach and I clean homes partime. I hope it helps, Tricia: ) Thank you for the comment! Love this idea, I haven’t bought household cleaner in a long time, so always looking to find a more improved technique. Will try it! Hope you like the orange twist! Is This is an anti-bacterial solution as well? I’m not sure vinegar is classified as anti-bacterial so I wouldn’t want to make that claim. I do really like vinegar as an all-natural household cleaner though! Vinegar, throughout history, has been reputed to have strong antibacterial properties. One test by Good Housekeeping’s microbiologist found that 5% vinegar is 90% effective against mold and 99.9% effective against bacteria, while a study showed that vinegar is less effective than Clorox and Lysol against poliovirus. Great information, Polly. Thanks for sharing! You are very welcome, Debbee. I hope it helps!! And just think . . . you can also use this vinegar/orange peel mixture on your favorite salad!! I have been making my own flavored vinegars for years. This sounds like a really refreshing way to dress up a green salad. You can even put chunks of orange in/on your salad and spray/sprinkle/pour some of this orange vinegar on it for a zesty salad!! I love the idea of using the vinegar in a salad dressing. For some reason, I never thought of this! Thank you for the idea…you are brilliant!! I found you through a Spanish organic-culture facebook group. I knew of vinegar properties as wood cleaner and lime [calcium] rust cleaner. The idea of de-odorize it wirh orange peels is awesome. I think it shouldn’t attack granite, but I remember that acid cleaners such as vinegar or lemon can’t be used on calcium-based stone surfaces such as marble. Thanks very much for the comment, Jose, and for the insight on stone surfaces. Hope you enjoy the orange scent! I was wondering how long the cleaner could last. I know vinegar is a good preserving agent, but is there a point at which the peels would need to be removed or the cleaner thrown out? I was thinking this might be a nice hostess gift they could use to clean up after the party! Would you recommend making it fresh with a note to leave it for two weeks or does it still look nice when it is ready and be steeped before gifting? I have left the orange peels in the vinegar for a few extra weeks, although I take them out when I transfer the vinegar to my spray bottle. If you give as a gift–which I think is an excellent idea!–I would note to leave them in for two weeks. Perhaps you could then suggest transferring to a spray bottle for easy household cleaning. Would like to comment re: Krisa’s comment. I like the idea of using as a hostess gift but could I suggest another option – Make a batch and strain of the citrus vinegar so your hostess can use immediately. You could even add a note with the recipe plus a piece of dried peel to decorate the bottle. Ann, I loved your post and the traffic and comments that it has generated. Some of the extra info. has been great. I came across the recipe elsewhere and tried it but I left my peels in for about six weeks. It was okay, just a little stronger. Worked great in the bathroom. Thank you for the thoughtful comment, Lorna, and for adding your own helpful idea to the string of comments. I always appreciate it when people share their own thoughts and ideas…one more excellent suggestion to add to the list! Are you aware that the acid in vinegar, as well as the acid in citrus fruit peel, will eat the wax off hardwood floors, discolour taps in the bathroom, and ruin the finish on ceramic tiles. Thanks for the comment. I have not had this experience. Has this happened to you? The vinegar will work great on your windows. Great at getting off any grease. Thank you for the helpful comment, Doris! This sounds very fresh indeed, also much cheaper than using cleaning products from the supermarcket shelves and safer. Thanks for the tip. You are welcome, Ann! Thanks for the comment…and such a good name! I use vinegar in my wash and rinse cycle. wash cycle for smells rinse for fabric softner. I use vinegar to wash my dishes to combat the soup film which comes out squeaky clean. I use vinegar in my bath.. good on my skin and hair. I use vinegar on windows floors of all kinds, counters.. I use it to kill some plants in the garden.. OH HECK I use it for just about everything. Sometimes I dilute it sometimes full strengh depending the job. LOVE the orange peel idea and will experiment with other sents. Thank you. You are welcome and I love all the things for which you use vinegar! Vinegar is an excellent fabric softener when added to the rinse cycle especially for baby clothes. My grandma got me started on it long before scent-free dryer sheets and softener came on the market. Very good to know, Sherryll! Thank you for the great tip! Thanks for this idea! I’ve been using vinegar on the floors since this summer when we got fleas really bad from our indoor/outdoor cat. The addition of citrus also prevents the cat from doing his business outside of the litter box! Who knew how helpful vinegar could be! Thank you, Melissa! Lavender sounds wonderful, Rondi! If you remember, please report back. I’d love to know how it turns out! I have had a jar on hand for about two months and it was fine. I would imagine the vinegar would act as a good preservative beyond that period of time. Similarly, I have had herb vinegar in my pantry for a year or so and it did not go bad. Hope this helps, Briana! The print-friendly button works, but the print-friendly page doesn’t seem to. An error message reads that an internal error is causing it to be unable to fulfill the request. This is a post that was entered into my site before I installed the print feature. That is why the print option does not show on this page as it does on the newer posts. I apologize for any inconvenience and hope the cut and paste method did the trick! A friend of mine posted this on her Facebook page and came over to thank you and make a couple comments..being a huge fan of orange oil (commercially called D-limonene), properly used, it is great to discourage ants and fleas from invading the house, and even to soften paint on most surfaces for easier removal and not have to use nasty and toxic solvents. Cheers and thanks for such a great suggestion! Thank you very much for your comments, Bob. You made some very interesting points which I am sure will be helpful to many. Coincidently, I was noticing today that it is time for me to make more! I love this Ann, my husband hates the smell of vinegar and this is the perfect solution I have been looking for. We always have citrus peels. Thank you sweetie! Great idea! I’m gonna try grapefruit and ginger peels since I’m a ginger fanatic. It’s the same scent I make to use around the house, so won’t clash. –Thanks! Ginger is a great idea, Nancy! I bet you could put a small piece in–not just the skin–to add something extra special. Let me know how it works! can I use this with alcohol too? I use both (alcohol on windows/mirrors/glass and vinegar on woodwork), and would love it if I could do this with both. I think the orange peels would be fine to add to alcohol. I have not tried it, however, so feel free to comment with your results if you give it a go! I have been making my own products for awhile now. I will never go back to commercial products. I love it! This cleaner looks great! Looking forward to trying it. I’m making it tomorrow! I am so glad, Jo! Hope you love it! Feel free to share any of your other favorite cleaners in this space…I bet they would be of interest to those who have posted! I haven’t tried lemon peels, but I think they would work well, Kyla! Ann, just wanted to tell you how absolutely brilliant this is. I do use vinegar for cleaning, that’s all we ever used on our windows when I was growing up, vinegar water solution – makes them sparkle and shine. I love the idea of cleaning with an all natural real orange cleaner and just happen to have an orange tree in my backyard – may have to borrow some lemons from my DIL for another batch!. Anyway, I found this on pinterest and showcased it today along with a couple other pins in an article on gather.com. I gave you proper credit with a link and used your pic. Thanks again for posting – as soon as I get around to making my own I’ll also post about it on my own blog with a link to you of course. I also add a couple drops of tea tree oil to my vinegar and orange mixture as a disinfectent. EXCELLENT idea! I’m going to experiment with this by putting the peel and vinegar in a food processor and then strain it through a coffee filter to, hopefully, spead up the process. I have three dogs and a cat and I’m tired of the vinegar (though temporary) smell in my house. THEN I want to try it with fresh rosemary!!! Wish me luck. Great ideas, John! Let me know how it works if you try it. Rosemary sounds like a wonderful addition! The friend who recommended this to me also recommends a few essential oils. I have clove oil and, mixed with the orange, might provide a nice holiday scented cleaner. Tea tree oil has disinefecting qualities, if you like the smell. Maybe rosemary and tea tree. If you don’t, tea tree and lavendar make a very nice combination. Many possibilities! Essential oils are something I have yet to try and I bet they would work beautifully. Thank you for the suggestions! When I bought a house a few years back, we found out that the huge family room carpet had been used instead of the littler box (thought the smell was just the filthy littler box in the corner– but it was the whole carpet!). The cat urine had seeped into the concrete below. Had to take the carpet and pad to the dump, but couldn’t find anything to get rid of the smell in the concrete (as well as a small closet in the bedroom– bet a cat got locked in there at sometime 🙁 ). Finally, a sales person told me to try vinegar and water. I was so tired of trying to clean it for the week before that I bought a gallon and poured it on. It worked! I used some in a spray bottle in the closet expecting it would discolor the hardwood– which I figured couldn’t be worse than the horrible smell. It took down the smell, so I used it another time and the smell was gone! AND it DID NOT discolor the hardwood. Great feedback, Trish! That odor can be difficult to eradicate and I am sure your comment will be helpful to many others, along with the details regarding use on various surfaces. Thank you! I found this on pinterest. I have been excited to give this a try. I hope you get to try it out and like! Thanks for the comment, Beth! I made a batch of orange peels and vinegar and stored it under my sink. I forgot all about it until my littlest cat, George, decided that my black winter coat was the BEST place to pee, and on the hoodie next to it, and the floor beneath it. Needless to say, I was not a happy camper. I ended up tossing the coat and the hoodie because I live in an apartment building and hogging the washer all day would probably cause the tenants to rebel against me. But I can’t exactly toss my carpet. I made a solution of the orange vinegar and water, half and half in a spray bottle. I also sprinkled baking soda on the carpet before I sprayed it down very well with the solution. It was fun watching it foam, but it also cleaned out the smell of cat urine. George has since been neutered so hopefully no more marking territory anymore. Long story short (too late, I know), this is the best idea I’ve tried for cleaning. I truly appreciate the feedback. It is always great to have another helpful hint and a new way to use this natural cleaner. Pet smells can be so hard to remove, so I think this suggestion is especially helpful! Can the vinegar and orange peels be sealed in any type of container or does the canning jar work best? I currently use vinegar/water to clean my house and love the results. Having 2 dogs with allergies this works great since they are not getting chemical cleaners on their paws and skin! I would say any glass jar would work. That said, vinegar and orange juice are sold in plastic, and many people transfer the mixture to a plastic spray bottle, so you could really use plastic. I think I simply do it this way out of habit! The oranges do alter the color of the vinegar a little bit after steeping for some time. I would not be concerned. I am guessing the cinnamon and the cloves probably contribute more to the discoloration…but I bet they are a delightful addition! where do you use this orange vinegar for cleaning? does the sweet smell or flavor/taste of the orange wont attract ants, flies etc? does this “mix” kill germs and whatnot? I especially like to use vinegar to clean my kitchen but use it in many other areas of the house as well. If you scan down through the comments, you will see lots of ways other people use it, too. I have not had any trouble with ants or other bugs and prefer this cleaner to various store-bought products labeled anti-bacterial. Hope that helps! i’m so excited to try this. Thank you! You are welcome…hope you like!! I am excited to try this using the peels from the 5lbs of Cuties I just brought my grandkids! My guess is it will take about 4 per jar. Does that sound about right? Using a similar size jar, you could probably add one or two more, as they are small and thin, although I think that will be plenty of peel to do the job! Now you can feel extra “green” as your grandkids eat the Cuties…and they may enjoy learning about what you are doing with the peels! I raise chickens and sell their eggs and I have heard this makes a great cleaner for their coops when we clean them every month! I have a batch sitting and I cant wait to spray everything with it in my house and outside in the coop! People really seem to love this for many animal-related uses, Midge. We, too, have chickens and I think you will like this cleaner for use in their coop and beyond! I love this idea, but I am wondering about any sticky residue left behind, from the orange peel. There is no sticky residue since only the peels are used. I hope you enjoy, Kamra! I do have sticky residue after using this solution to mop. I am wondering if I need to dilute the solution with water, or do a rinse-mop afterwards? I usually dilute with 50 percent water, Natalie, so that could make a difference. I do this as much to stretch the solution yet do think it is more than adequate strength-wise. Maybe try a quick rinse and next time go with a 50-50 mix of vinegar and water. I hope that helps! I think this could be wonderful, JD, and am not sure why I haven’t tried it yet! Please feel free to share your results if you try and, hopefully, someone else will comment if he/she has done this already! What a great idea! I have orange peels, two cinnamon sticks and lots of cloves soaking in vinegar right now. I used a clear glass jar and it’s beautiful! What a great hostess gift – the jar of soaking peels plus an empty spray bottle with an ingredients list and any instructions written on nice paper. A thoughtful and practical gift, Brett…economical, too! What could be better? Love your beautiful addition of cinnamon and cloves. Thank you for the comment! I’m trying this now with orange and grapefruit peels. It’s been a few days and I’m noticing little white dots of the peels now. Is this normal/safe? I haven’t noticed white dots, Moe, but I can’t imagine it would be a problem as the vinegar makes it difficult for anything bad to grow. Perhaps the peels had something on them and the vinegar is, in essence, removing it. I doubt it would amount to enough of anything to be problematic. You are most welcome, Pinny! Thank you for the great feedback! Mine turned a slight brownish color. I still use it because it smells like it should, but do you know why it did that or how I could prevent it? Thanks so much! The color will dull a bit, Joanna, but mine doesn’t turn brown, per se. I am assuming your oranges were fresh and that you used plain old white vinegar. Maybe you could get away with fewer peels to the amount of vinegar…or maybe it was just the variety of orange and the amount of oils in the peel. Either way, I don’t think it is a bad thing at all as the orange oil certainly has benefits! Thanks so much for replying! I love when bloggers actually reply to comments! I asked a friend of mine too, she and her mother both use this stuff too, but she didn’t know why exactly either. I very well may have crammed too many orange peels in there. I’m derpy like that. You are very welcome, and I hope you enjoy, whatever the color!! I just found this post after I stuffed a mason full of my leftover lemon peels and poured vinegar over them about 2 days ago. 🙂 I never thought to try orange or grapefruit. Great post thanks for making me feel sane for doing this.Lol. Too funny! And I am impressed you were already on it when you happened to see the post! I hope you enjoy all the possibilities! I love using your orange vinegar with great success, but as for wood floors (which many of your readers are asking about) I use the tip from Linda Cobb’s book, “Talking Dirty with the Queen of Clean” which I have used as my cleaning bible for years. She suggests using Black Tea for cleaning wood floors because of the tannic acid that’s in the tea. She says to brew 1 or 2 tea bags in a quart of boiling water and after letting the tea cool you wring out a soft cloth to just-damp and wash the floor with it (being careful not to over-wet the floor). I do this with a wash cloth and put it on a Swiffer-type mop, I rinse it clean with plain water when I need to, put it back in the plain tea, wring it out and put it back on the mop. I continue this process til my floors are clean. She advises to buff with a clean soft cloth for a nice shine, if desired. (I am in no way affiliated with her or her book. I wanted to give proper credit to the person I got the tip from. She first brought attention to cleaning with natural cleaners for me!) I have been doing this for years with wonderful results! Love your site by the way! It is comments like yours that are an ever-present reminder of how fabulous my Fountain Avenue Kitchen friends are, Jenna! Thank you for taking the time to share such a great idea and how, exactly, you implement it. I had never heard of this tip and can absolutely see the brilliance behind it….and I just so happen to have some good old Lipton’s tea bags in my pantry now! I am sure many people will be trying. Thanks again! I’ve been using white vinegar for years to clean (windows, mirrors, counters, adding it to my dishwasher to cut lime deposits and so much more) but never thought of adding the orange peels. I’ve got three oranges on my counter just waiting to be peeled and soaked for two weeks. Thank you so much for this information to a nicer scent when cleaning. Thank you for the great comment, Babs, and I hope you really enjoy this! I used those little oranges-mandarin maybe? since that’s what gets eaten quickly in our house. Anyhow, I let them sit in white cleaning vinegar for a full two weeks and strained into a spray bottle. Is it supposed to be thick and syrupy-like? Clementines, perhaps? Any kind of orange should work, and the vinegar doesn’t get syrupy. It stays the same, watery consistency as regular vinegar. I hope that helps, Amanda, and that you enjoy! I just opened my two 8 oz canning jars which I had filled up with peels from three oranges (there was not much space in between) and vinegar two weeks ago. There is not much vinegar left, most was soaked up in the peels and some a bit gel like on the bottom. It has become liquid rather quick and I had to squeeze each orange peel to get some vinegar out. It smells wonderful but its not much. I will try again, this time with only one orange peel per jar and hope for more vinegar to use afterward. I’ll keep you posted. I use a 16-ounce jar and peels from two oranges, so I can see why you ended up with very little vinegar using three peels in an 8-ounce jar. I think your idea to use one peel in the smaller jar is perfect. Then, if you like, you can move to the bigger jar. Let me know how round two works out! Did your vinegar have a slight orange tinge to it? I am doing this now, and I left a little pulp on the peel by accident. Will the slight color cause stains when I use this? The vinegar will take on a slightly orange hue and this should not pose a problem. I hope you enjoy! Can you use more than just the peel of a citrus fruit? I have a friend who caters and uses a lot of lemons/orange/lime juice in her recipes, but throws the rinds out. She uses a hand held old fashion ‘juicer” so most of the pulp is removed, but still has a bit of pulp and those inner section fibers. Could I just through the entire half of the “used” lemon in with the vinegar, or MUST I CUT OUT THE CENTER JUNK and just use the peel? Great question, Lisa. I just use the peels although the vinegar would most likely preserve any pulp that would be included. If any other readers have an opinion one way or the other on this, please feel free to comment! Think I will make up two small bottles using lemon. One will be with JUST THE RINDS and the other with the “used lemons” as I receive them. Will let you know how it works…. Thank you for the kind words, Lisa, and I am excited to hear the results of your experiment!! Only one question. White distilled vinegar or cider vinegar? It looks like white vinegar was used but just wondering? You are right, Carol…plain old white vinegar it is! So, I tried it and I love it. I used it on our nearly 50 year old never treated hard wood floors and they look simply wonderful. On the second wash I added 1 part Castile soap to 4 parts vinegar orange water mixture. Honestly the floors have never looked better! I have also used the mixture on our equally as old kitchen cabinets and they are not only grease free but also so shiny and beautiful. I’m so glad you posted this recipe!!! Jo Anne, I am thrilled you had such success with this easy, natural cleaner and so appreciate the feedback. Thank you! I so love the idea of this natural cleaner and I love the aroma of Oranges, so I’m really excited to try this cleaner out…I do have a question about it…First off I’m having to use the 8oz canning jars being that that’s what I have on hand at the moment…now my peels have been soaking in vinegar for 6 days so far and I’ve noticed that the vinegar looks as though it has more of a syrup consistency now…my question is, is it suppose to do that? I am guessing that you are noticing a slight darkening of the vinegar which might make it look syrupy. This is normal after the peels steep for a number of days. Please let me know how you make out, and I hope this helps! My mother was born in 1905 and she taught me to use vinegar and olive oil in water to clean furniture. Never put polish on it..The above keeps the wood from drying out. Orange added to the above would make it a great all around cleaner if you leave the oil out. The citrus is good at removing stains. Sometimes if the stain is too dark, use lemon juice and let it sit on item, or counter, or whatever. Sometimes you have to make a bandage patch and tape it on. Thank so much for your comments, Anna. Great information! 1) Without thinking I already diluted the vinegar & peels with water. 2) I went ahead and put the mixture in a spray bottle since I didn’t have a mason jar on hand. It’s two days old so I don’t mind tossing it out. Suggestions? I wouldn’t worry, Crystal. Even if you already diluted it, you should be fine. In fact, you might just end up with a little more orange essence as the water will be infused with it, too! And since it is ultimately stored in a plastic spray bottle, starting it there should be fine. Just remove the peels after two weeks. I hope this helps and let me know how it turns out! Thanks for sharing this great idea! I operate an organic cleaning business. From day one I’ve used the 50/50 vinegar & water solution. Some suggest adding a bit of soap (organic) or some baking soda to the mix. I don’t. I have incredible results using the white vinegar/water solution. I too got bored with the smell. I also hold a certificate in aromatherapy so I started to incorporate essential oils into the mix. I use a 32oz spray bottle 50/50 vinegar/water and 15-20 drops of essential oil. Orange/Rosemary is my favorite for the kitchen, while peppermint is my favorite for the remainder of the house. Lavender is wonderful for bedrooms. Each oil is anti-bacterial and anti-microbial which boost the already effective qualities of the solution. But each essential oil/scent has its own energy that bring a whole atmosphere to the home. I also use microfiber cloths and mops which on their own with simple water rid 98% of dirt & bacteria. All around a good recipe for organic non-toxic cleaning of your entire home top to bottom. In terms of natural stone surfaces, and times I need to scrub I use plain baking soda. You can mix up baking soda and water in a small spray bottle and spray the surface. But I’ve found it is just as easy to put the baking soda in a cheese shaker and sprinkle directly onto the surface using a wet microfiber cloth to wipe down. I hope the idea of including essential oils helps those who don’t care for the smell. I would like to add , however, a question. Isn’t it better to smell vinegar for the small window of time you smell it until it dissipates than to smell chemicals? Isn’t it worth the inconvenience of a temporary smell, for your better health? For me the choice was simple. I’d rather use these products,which are just as effective than to deal with terrible headaches that I get from using commercial toxins. Hope these suggestions help. Cheers, to a healthier happier you! Great information on essential oils…thank you for sharing your insight. I may be one of the strange people who actually likes the smell of vinegar, but I like it with the orange scent even more! I’m sure I would love your options equally! Great idea, I’m going to soak mine today and add a couple of drops of essential oils as suggested by K. Brito. I’m glad I came across this during my spring cleaning week. Great timing! Thanks for the comment. Can I use a plastic container instead of glass? That would be fine, Rasheda. Although I steep the mixture in a glass jar, I store it in a plastic spray bottle. I just started one of these and added some fresh ginger to it. Thanks for the idea. Love the idea of adding ginger, Amy! Thanks for sharing it! Pingback: Orange/Vinegar Cleaner | My Adventures With Pintrest! Could you make this into wipes? I make my own baby wipes by using about an inch of water into a container with a squirt of baby oil and baby shampoo. Then I put half a roll of paper towels and turn over after half an hour. They’re ready to use. Do you think I could pour an inch of this mixture into the container and make it the same way? I love your baby wipes idea, Amy, and see no reason why you could not do this successfully with the orange vinegar. I bet many people will try after reading your helpful idea…thank you! This is such a great idea! I found it on Pinterest with the suggestion of trying lemon peels. I just store my lemon peels in the jar of vinegar and add more peels/vinegar as I need to. The peels are FABULOUS deodorizers for my sink disposal and the vinegar is the best for wiping down my fridge and microwave. Thanks for sharing! Thanks for the great comment, Sarah! Lemon peels as a sink deodorizer is a tip my mother taught me. Thanks for the reminder…it really does work! I do…sort of! I’m not a very good tweeter but manage one every once in a while! I seem to remember to post on Facebook more often. You can connect through the button on the top of the website…Fountainkitchen…and I am so glad you are enjoying the posts. Thank you! Orange and rosemary make such a wonderful combination! Thank you for the feedback, Courtney, and I hope you enjoy using this easy cleaner! I read that the orange and other citrus smells repels the nasty little crawlers. This is a great idea to try because its very strong and not to mention kid safe. I hate bugs and will try anything to keep them away from my home. I agree, Rosie, and especially love to use this in my kitchen where the kids eat, play, and do homework! Vinegar is a known ant deterrent. It doesn’t kill ants, but it does mask their trail “scents”. I spray my counters and floors around the base of my counters with 1/4 strength vinegar once a week to keep them out of my kitchen. This would stop my kids from saying, “What’s that smell? Did you spray vinegar again? Yuck!” Thanks so much for the recipe! I noticed a trail of ants in my kitchen earlier this week and thought of your comment. After two days of spaying with the vinegar solution (twice each day), they were gone. Thanks for the helpful suggestion! Pingback: How To A Make Green Cleaner • MY DIY CHAT • DIY Projects, Crafts, Gifts and More! I made this and it left such a sticky residue that took more cleaning time and another cleaner to get off. I don’t recommend. Thanks for the comment, Marsha. I am wondering if some of the orange was mixed in with the peel. I have not had a problem with sticky residue and most people have had success with this as well. This is one possible culprit that came to mind. Thanks for your ‘Orange Vinegar’ Recipe. One of these days I am going to try with grapefruit peels, Lorna! I bet that would be wonderful, too. Thank you for your great comments and for the link. I originally heard of this idea through a share on my Facebook page and gave it a try. I never had a source, but perhaps that is where the person who originally shared the idea with me came across the concept! I was recommended this web site by my cousin. You are amazing! Thanks! Howdy! This blog post couldn’t be written much better! Reading through this post reminds me of my previous roommate! He continually kept preaching about this. I’ll forward this information to him. The slimy looking jelly that has been reported by a few posters is called “Mother of Vinegar”. It can be caused by a few factors. Vinegar is simply created by the fermentation of ethanol. Cellulose or non-fermented sugar contained within the vinegar can sometimes cause mother of vinegar to form. It is more common in unpasteurized vinegar. It is completely harmless and the vinegar does not have to be discarded. Although harmless, it is quite ugly, so you can remove it by straining it with a coffee filter. Hope this helps. Also if you decide to try the conditioner, apple cider vinegar has a higher PH. I have never heard of this! Thank you for your comments, Amanda, and for the information regarding use as conditioner. Thanks a ton! This is definitely an impressive site. Pingback: Orange Vinegar - A Green Cleaner - TJF Construction, lnc. Using the vinegar as a hair rinse is also good for keeping the hair nits at bay. When my children where young and at school they caught the little bliters. Did the usual treatment with the chemicals and from then on rinsed in vinegar, they never had any trouble for the rest of their school life, even though there were regular reports from other parents that the nits were running rife through the class. Great to know, Kay. Thank you very much for sharing your helpful personal experience! it. Is there anyone else having identical RSS problems? Anyone who knows the answer will you kindly respond? Did you create this web site yourself? Please reply back as I’m wanting to create my own personal site and want to learn where you got this from or what the theme is called. Thank you! Thank you for the message. A friend who is more tech savvy than me helped when I first started The Fountain Avenue Kitchen. It has been long enough that I forget what the WordPress theme is called. There are a lot of good options! Good luck! Several people have said they love using this as a hair rinse. Since you end up with just the oils from the citrus peels, I think the addition would be great. Thanks so much for your comment, Joanne, and I will be thrilled to have you as a frequent visitor! Pingback: Citrus Infused Vinegar | What The Flicka? thing. Do you have any helpful hints for inexperienced blog writers? I think if you do what you love, you will do it well and it will most likely resonate with people, Baju. I started this website as a labor of love to share my recipes with family and friends…no special computer skills, no photography background…just my iPhone, a love of cooking, and a desire to see people slow down and enjoy a meal together. Best of luck to you and thank you for your comments!! This is a great cleaner but I must caution NOT to use on plastics such as the panel front of your microwave or knobs on the stove. Orange oil can be very caustic and will actually melt plastics. How do I know? My hubby used a commercial “green” orange oil product to clean the radio front in our truck. It is a clear plastic and it became permanently foggy looking from the “melting” action of the orange oil in that cleaner. Citrus oils are also extremely drying (therefore damaging) to natural stones so I would definitely not use this on granite or marble. Also, many here keep mentioning that there are no chemicals in this cleaner. That is not true, as orange oil is a chemical solvent and that is why it is used in those orange oil cleaners we see on the store shelves. It has been used industrially for years – homemakers just didn’t realize it and now it sounds “natural” since it’s “just orange peels”. Be aware of what you are actually dealing with. In addition, it is very important to understand that essential oils are also very strong chemical compounds and they can have strong adverse effects if not used properly. They are wonderful when used safely but some of them can stimulate uterine cramping and cause a miscarriage. Others, like rosemary, are brain stimulants, revving up the system and they can elevate blood pressure – not good if you have high bp already. Lavender, while a wonderful calming agent that actually lowers the “revving” of your system when used judiciously, has been shown to be toxic for cats leading to irreversible liver damage. I would never use lavender in a house with cats and especially not if they could get it on their feet – animals absorb chemicals through the skin and they do not have to be immersed or have long exposure to do so. I highly recommend researching the use of essential oils by reading strong source books such as Patricia Davis’s “Aromatherapy: An A to Z”, anything by Robert or Maggie Tisserand, and Marcel Lavabre’s “Aromatherapy Workbook”. These people are out of the EU where aromatherapy has been used for decades, it’s been studied in depth and incorporated into “regular” medicine with pharmacies actually dispensing it by prescription. Here in the US, we have NO integration of these oils with our health care. Consequently we are at risk of believing the marketing pitches by sellers that the oils are nothing but good for everyone for every reason. Wrong. Couple that with the American typical idea of “everything is better when you use 3x or 10x the amount stated” and it’s a recipe for disaster, overdose and possible horrific outcomes. I have studied oils and use them but with great care and I suggest everyone should do that same. We must also remember that those selling the oils have one main goal: to make sales. They are not in it to educate the safe use of these unregulated substances that are not embraced by our medical professionals. Point is, no “expert” here is going to help someone use them safely, we must learn on our own how to protect ourselves while using these natural remedies. PS – if you doubt the strength of orange oil or other essential oils, try this test. Get a 2 oz plastic spritzer or lotion bottle and add about 1 & 3/4 oz of spring water to the bottle. Now add in 20-30 drops of any of your favorite essential oils. Shake it up and cap the bottle and let it sit. In a month’s time, you will notice the plastic of the bottle will begin to buckle and deform slightly. This is the melting action of the essential oils eating away at the structure of the plastic. The longer the solution sits in the bottle, the more deformed it will become. I have some bottles that have become so distorted over time that they will no longer stand up straight. Water does not do this, it’s the oils. Thank you for the great feedback!! Absolutely…this would be great in a recipe! If you use 80 proof vodka or rubbing alcohol instead of the vinegar, the cleaner can double as sanitizer. Research perfume making, if you are interested in other scents. Or experiment with other types of citrus. I’m planning on testing out grapefruit peels. Does the jar/ container have to be glass? And why? It would not have to be, Nicole. I tend to use glass jars because I always have them on hand. Is there any risks of attracting ants or others bugs to the surfaces sprayed due to the sweetness of the oranges? Since it is only the essential oils from the zest that are used, this has not been a problem. Ann, I haven’t read all the comments, but I have a suggestion. The pith(white part) of the orange does not contribute to the end product here. I would rather use a zester tool on the Oranges. This will cut down on the bulk…keep the vinegar being absorbs and stimulate the zest to release it’s essential oils. The gel that many have reported probably comes from the pith. Great idea, Claire. Might be worth a little extra effort! I did this as well as “cooked” the tightly closed jar in a normal cycle of washing a load of dishes in my dishwasher. The orange peel “oil” was released into the vinegar and the smell was very orangey. I had never thought of that, Melissa. Thanks for the novel suggestion! I didn’t have any orange peels but did have the mandarin oranges so I used them and a couple of whole cloves. After the first day the vinegar smell was gone and was replaced with a delightful citrus smell. I continued to add the peels as the mandarins were consumed. It’s been sitting a over two weeks now on the counter and is still clear, so I’ll drain it and transfer the solution to another bottle and get ready to start again. I have grapefruit now also. Thanks for the “recipe”. One thing that wasn’t mentioned but after I used a bit of it a few days ago, my cats no longer get on the counters! I am thrilled you like this and, as a bonus, that your cats stay off the counters! Could you use peels from juicing oranges, or would the bits of orange left make it sticky? I think it’s best to just use the peels. You could pull out the “insides” so you can use the peels of the juiced oranges. I was recommended to this website by my cousin. You’re amazing! Thanks! This looks like an awesome cleaning recipe. But I have a question. You say two large oranges. My kids do better with “Cutie” size ones. I hope these will work but I’m worried about the orange/vinegar ratio. What is your suggestion or thoughts on this? I would fill the jar with the cutie peels and pour the vinegar to fill in all around. I think this will work well! I have been doing this for a year now–love it. Maybe I should try lemons and limes and such as well though, TY! I mixed grapefruit and orange peels, and the grapefruit peels starting rotting after 1 day! It was very strange. I took them out and am continuing with the orange peels. It could be a fluke. Perhaps the grapefruit were a little old or there was a fungus or something else that expedited their deterioration. Usually the vinegar will act as a preservative, so I am somewhat stumped. Hopefully, your orange peels cooperate better! Your web site has offered us valuable information. How many times can I reuse the orange peels? Do I have to make a fresh batch each time or can I reuse the orange peels each time I empty it out to use? Not a silly question at all! I don’t reuse the peels. You could, but there would likely not be enough of the oils remaining to scent the vinegar…at least as well as when using fresh peels. I have made some of this wonderful cleaner, and probably let it set for a little longer than i should have. The vinegar is just below a couple of the peels (at the very top of the jar), and they have turned a brownish/black color…. Would I be introducing bacteria if I went ahead and bottled it up tonight? Great post! Been reading a lot about cleaning my home with vinegar. Thanks for the info here! This one is really interesting. Usually, I have vinegar for cleaning but I stopped because of the strong odor. I’ve been using baking soda and lemon sometimes. But thanks to this, I can surely try this one! I have hardwood floors and use nothing but a mixture of water and vinegar to clean the floors. My wife hates the smell of vinegar, but I don’t mind it. She does love oranges, so this might just be what we both need. Plus the citrus should help repel unwanted bugs like ants and spiders. I do have one concern though. Does the vinegar turn orange? If it does, will it discolor my floors? The vinegar has a very faint orange tint that I don’t think would discolor your floors. To be sure, you could dilute it to start with and/or test a small area. Hope you–and your wife–enjoy! Thanks so much for the quick reply Ann. We’ll get a small batch going this weekend and test a small area like you suggested. I’ll be sure to return and give a report once we’re done testing. I look forward to hearing–or reading–how you make out! So glad you enjoy, Megan! I think it’s a great idea, Mona. If you try, please report back! I have used mandarin peels, after bottling a whole load of mandarins from my tree. It smells totally amazing, but haven’t quite got round to straining it yet. Does anyone know if I can use the leftover peel for using in a wood fired oven/stove as kindling if left to be dried out first? That is a good question, Gael. Perhaps someone else has tried. I’ve strained the vinegar and put the peels out to dry in the sun on a tray, although this may take some time at this time of year. Can only try and see if it works in the outdoor oven. Good luck! Let us know how it works! Are there any other good uses for the peels after steeping them? How many times can you use the same orange peel? can you use it more than once or do you throw them out and use new ones? Fresh peels will guarantee better results, Peggy, as much of the oils will be absorbed into the initial batch of vinegar. Of course, you could certainly try a second batch with the used peels and see how you like it. Happy cleaning! It should last for many months, Jen. The vinegar itself acts as a preservative so you should be fine to use it for a long time. I was wondering if I have to use white vinegar, or will apple cider vinegar work? I have two gallons of it right now. I have never used apple cider vinegar for this, Tony, but I think it would work just as well. Might as well use what you have on hand! When you say to use vinegar, do you mean like distiller white vinegar? Or the “multi-surface vinegar” they sell at Target? Plain old distilled white vinegar–the kind you would use in cooking–is perfect for this! I would only use the peels for this. You just want the oils in the peels, not the sugars in the actual fruit which could make things sticky. Incredible cleaning recipe! Thank you a lot for sharing such an amazing way of cleaning! It sounds incredibly easy to make this cleaner myself! I use a lot of baking soda-lemon-juice-vinegar-castile soap mixtures. Those ingredients (in some form or other) can be used on pretty much every surface in the apartment, from windows to stoves to grimy bathtubs. And they are cheap. This might actually work for killing weeds as well, plus it would be safe around the kiddos and pets! I made a similar recipe, instead of actual oranges I just used orange essential oil, but this would be MUCH less expensive! I can’t wait to try it for cleaning and killing my nasty weeds! I’m so glad you came across this and took the time to comment. Hope it works as well for you as your version with the essential oil! I am so happy to land on your website! Really useful article! I definitely gonna try this! I am keen on natural and chemical free products! As a mother – this is obligatory for me! Thanks and thumbs up for the great post! Making some right now one orange, one lemon, and two cinnamon sticks. I love the idea of giving this along with a bottle, and the instructions as gifts. We are doing a more handmade Christmas this year so after some ‘testing’ I see this being a good gift idea. Question I have read that anything with essential oil should be used in a glass container so do you use a glass spray bottle afterwards? My spray bottle is plastic, Stacey, and I haven’t had a problem. I love your addition of cinnamon sticks and am so glad you like this as a Christmas gift idea! I did this and I also fish out a peel from steeping and toss it in my garbage disposal with a light trickle of water running and let it go! Its way more economical that all the chemical disposal cleaners and smells great. Grinding the peels in the disposal does smell great. Thanks for mentioning, Staci! I just mixed some tangerine peels and apple cider vinegar together because I didn’t have white vinegar, I was wondering if it would have the same affect? I haven’t used apple cider vinegar for this, Kay, but I think it should work similarly. One thought…if the type of vinegar you have has sediment in it, you might want to strain it through a coffee filter or cheese cloth before using. Well, now I’ve got to go ALL natural! I’ve been saying I’m going to, that the sprays were clogging my lungs…and sure enough, they have been! I’m excited to try everything on your blog! Now just getting everything bought up, that’s the thing, then everything else will go smoothly…and I can get my mother to switch over too! I’m sorry that allergies led you here, but I’m glad you found my site and hope you find some new things you like. Thanks so much for the comment! I love this! Orange vinegar cleaner will make great Grandparent gifts especially since they are downsizing! I bet they’ll be thrilled! I tried this on cleaning the stained toilet seat with out watering down the solution. Not sure why but it didn’t clean at all. It’s not like bleach, Michael, so depending upon the type of stain it might not be strong enough to eliminate it. Thanks for this. I was making citrus cleaner with kombuca vinegar and it was smearing. I obviously wasn’t diluting enough. I tried 50% water and it worked heaps better. So glad this was helpful, Jo. Thanks for your comment! I did this but just found the jar it’s been sitting under dark pantry for six months… Can I still use this? As long as it looks fine, you should be ok. Vinegar is also a good natural preservative! Why can’t you use the insides as well? You don’t want the sugars from the fruit mixed in, just the essence from the rinds. The actual fruit would likely make things sticky. That’s awesome, and I wish I could try the calamondin! Are there any suggestions for uses of the orange peels themselves after the soaking? Good question, Jenna. You could try using them as aromatics inside a whole chicken or under a fillet of fish or pork. Or dry them out and see what they smell like. Maybe use them in a potpourri? Maybe other readers will have more ideas! What if the oranges are old and you don’t want to eat them, can you throw the fruit in there too? Or only soak the peels? And if only the peels, why so? If you add the actual fruit, the sugar would make the mixture sticky and not very good for cleaning. You just want the essential oils from the skins. Hope that helps! I don’t have a comment but a question. I saw this on fb and looked it up to see the truth. On the fb post it also says it’s good for bug spray. Is this true? I haven’t used it as bug spray but others have said it works. Let me know if you try! I am using this as a saving money technique — am on day eight of waiting. I transferred it to a juice bottle and the orange is becoming smellable. My mum buys vinegar spray so I know it cleans well. Looking forward to spending less than two pounds (if u count cost of oranges) for two bottles of cleaning spray. And the colour is quite nice too. Plus it’s healthier for my cat. Looking forward to not buying chemicals again other than pine cleaner for my floors. Thanks for your comment–and I agree, the color is quite pretty! I found some old citrus cleaner in my pantry and it had corroded the metal lid of the mason jar! I used it anyway, diluted halfway with water, and now I’m wondering if that was unwise… Like, could it burn my skin?? Is there a danger in it sitting too long? Hi Erin, Vinegar is said to have a nearly indefinite shelf life, so I think you were fine to use it. Its acid nature is what would cause it to corrode the metal lid over time, but that same property makes vinegar self-preserving. Hope that helps! Decanter That Didn’t have a lid. I presumed the vinegar would deter any spoilage. Its been 2 weeks now. It smells great-no apparent mold. Do i need to Throw itout? I think it should be ok, Zia. I found a jar of vinegar and orange peel that I made a year ago and forgot about, do you think it’s still useable? Can I use the solution on rubber or plastic tools that I use to eat with when I’m outside and say without washing it off with water, Perhaps soaking it in a orange solution jar? It would be fine to eat off the tools after cleaning with this solution, Dee, as the vinegar is food grade. However, if you’re cleaning a grill utensil that’s been used to handle raw chicken, for example, I’d err on the side of safety and wash and rinse well inside. Lavender sounds like a delightful addition! So my curiosity lies with the microspic effect… does the orange vinegar, diluted in half with water, kill viruses? Bacteria? E. coli? Or is it more just for removing visible surface stuff? I truly don’t mean this to stir the pot! I have a bottle of 1/2 vinegar 1/2 water that I’d love to spruce up… but I’ve found that I tend not to use it because I’m not confident in its power/performance. I’ve used vinegar as a basic cleaner for years after reading about its merits as a natural, non-toxic, inexpensive disinfectant. Because it is an acid, it’s been shown to kill bacteria and viruses. Studies have demonstrated, for example, that it is effective at killing the flu virus. That said, it is not as powerful as some commercial disinfectants and I can’t speak to it killing E.coli or any other specific virus or bacteria. Here is an article that may offer some additional insight and help you make a decision as to how you’d like to use (or not use) vinegar: http://www.abc.net.au/news/health/2018-01-12/does-vinegar-really-kill-household-germs/8806878. I want to try this but not sure what it will actually clean? Or remove grease from oven? Hi Sandra, I frequently use this as an all-purpose wipe for my countertops, sink, etc. It does cut through mild grease and grime, so you could definitely give it a try in your oven. Hi, I made a batch and started using it, but it leaves marks on glass surfaces. Did I do something wrong? Hi Jess, Did you steep the peels only? If pieces of orange were mixed in with the vinegar, that could leave marks. If this doesn’t answer your question, let me know and we can troubleshoot further! Thank you thank you thank you!! I’ve wanted to get away from the chemical type cleaners, but I have to admit, using the all-natural ones always makes me think that they’re not actually killing any germs. My pleasure, Nancy! I’m glad you found this. My feeling is that most of the time, we don’t need heavy duty cleaners. However, if there are places you’re concerned about it terms of serious germs, you could use the harsher chemical cleaners on a more limited basis. I have a mandarin tree but not orange. Would mandarin work also do you think? Hi Gilli, The mandarin orange peels should work well! What is the purpose of orange vinegar as a cleaner? It’s a mild disinfectant and many people like to use it as an inexpensive, all-natural option to expensive store-bought products. I’ve been using vinegar in my rinse cycle–1 cup per extra large load. (Since I don’t have a dispenser, I just add directly to the washer after it has begun agitating during the rinse cycle.) I have read elsewhere on the internet that use of vinegar can rot rubber hoses and seals. What do you think? Anything to worry about? Hi Alice, I would think it would be fine, especially when well diluted diluted – although that would vary based on type of washer. New models tend to use so much less water than older ones. You could likely get a similar benefit from a smaller quantity of vinegar, and to be absolutely sure you could ask a plumber. I just made mine. I’m so excited I put the date on the side of my jar and put it in a cool dark space. Will shake every two or three days. I am too excited – two weeks from today I am going to do a deep house cleaning. The funny thing is that I just used mine before reading your comment, Marie. So glad you made it and happy cleaning! Ok. Sooooo…I definitly put it in a dark place, and then totally forgot about it. I put the jars up before on November first. It is now January 9. Smells good but it is dark. Think maybe I should dilute it more or use it and see how it goes? Like baking soda, vinegar has long been considered and all-natural cleaner. Beyond the good smell, the essential oils in the orange peels also have antibacterial and cleansing properties. I have also read they detracts ants! everyone says to use glass jars. Has anyone used plastic jars with plastic lids? I have a hard time getting glass jars of any size where I live (Mexico) unless it is liquor bottles, which if course won’t work. I have a little hotel and am striving to find green cleaners. Hi Marcia, Vinegar is often sold in plastic containers these days so I think you’d be fine as long as you use a food grade plastic. Hope you enjoy it! Should white vinegar be the only vinegar or can I use any vinegar? Hi Sabrina, White vinegar has traditionally been recommended because it’s the most acidic vinegar. It’s also clear and doesn’t leave behind a residue as some other vinegars would. I read this is also a good ant killer, but after I tried it, I had more ants then before. I haven’t had experience with using vinegar as an ant killer, but perhaps it’s the odor of regular vinegar – that the orange peels mitigate – that is the primary deterrent. I heard this is good for ant /insect repellant too? Hi Jimi, I have heard the same thing and there are several comments on this post mentioning that. Coincidentally though, the commenter just before you said she tried and did not have good results. I rinse my hair with apple cider vinegar daily because I have scalp plaque psoriasis, I wonder how it would be to put some in there? I think this would be a lovely alternative, Rebecca! I’m so glad you found this, Amy, and hope it helps! Fantastic idea I am going to try it . So happy to read this, Lisa! I have 2 1QT mason canning jars steeping. I filled them one ‘skin’ a time, adding a ‘drop’ of vinegar as the jar filled. One has Tangerine rinds & the other Orange rinds. Tangerine has been about 10-12 days since I sealed it. Orange about 2 days. Hi Ron, Tangerine skins would be a fine option. I mention towards the bottom of the recipe to dilute by 50% for cleaning, simply because that’s what has long been recommended and it’s always worked well for me!